'Your Average British Neo-Nazi Is Slightly Psychotic & Cowardly' – Watchdog Rep.
Sputnik: How successful are neo-Nazi groups in recruiting Britons to fight in Ukraine? Matthew Collins: Not very successful, as we are finding out. The problem is that your average British neo-Nazi is slightly psychotic and cowardly and more likely to want to fight a war over the Internet and from his bedroom. So, the Misanthropic Division, who have been active in the UK, have found it very very difficult to encourage people to go there. Now, that may change in the short term, maybe even the long term, given that we have warrants issued for a number of far-right extremists in this country, we have a number of terror-related trials coming up in the near future. So, that may change. We are aware that people have been to Ukraine to look at the situation, to see how the land lies, but we are not aware at the moment of any British nationals engaging in terrorist activity in Ukraine. Sputnik: What groups are involved in the recruiting effort? 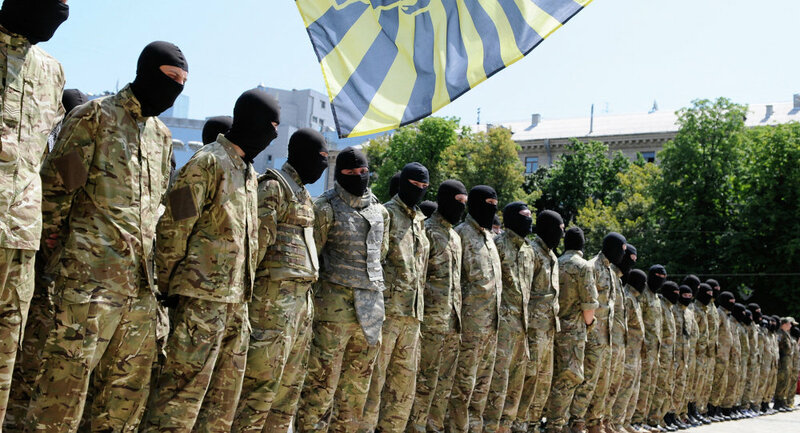 Matthew Collins: Well, that’s the Misanthropic Division, obviously which you are aware of, which is a front organization for the Azov battalion; they're domiciled in the UK. Their lead link person is an Italian who is linked to the CasaPound organization. He’s been visiting the UK since 2015, and the Republic of Ireland, we believe, to try and establish links with people who may want to go and join international battalions fighting in Ukraine. Part of the selling point that they're using that has some appeal to people is that it’s some kind of great battle against Russian imperialism, or it's an anti-communist fight. So they're having to use really very basic language to try and encourage people who are quite underdeveloped politically, as most of our far right is, to try and entice them to go, encourage their sense of adventurism. We don’t believe they've had much luck. We are seeing them step up their efforts —the organizations, the Misanthropic Division. We know The National Rebirth of Poland, which is a hardline neo-Nazi group from Poland, which is very small in Poland, but is domiciled here in the UK, is also involved in this idea to recruit people from groups like National Action and the National Front, and other more tiny sporadic groups around the country. The views and opinions expressed by Matthew Collins are those of the speaker and do not necessarily reflect Sputnik's position.